Picture 1. 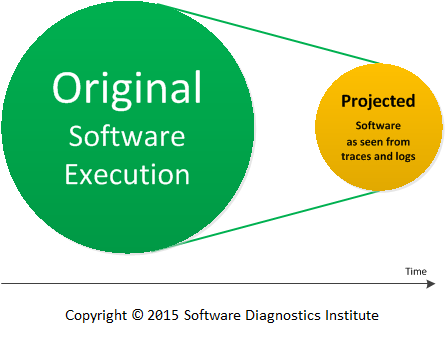 Original software execution is mapped into projected software as seen from traces and logs. Picture 2. 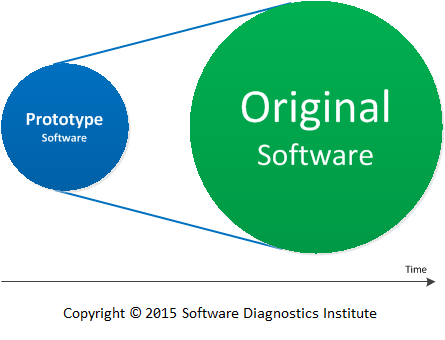 Prototype software is mapped into the product. Picture 3. 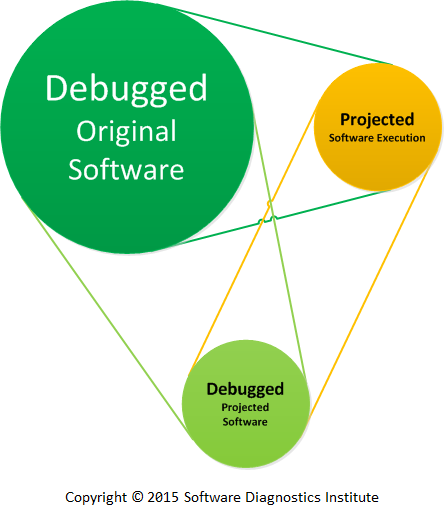 Debugged projected software is mapped into the original software. Picture 4. 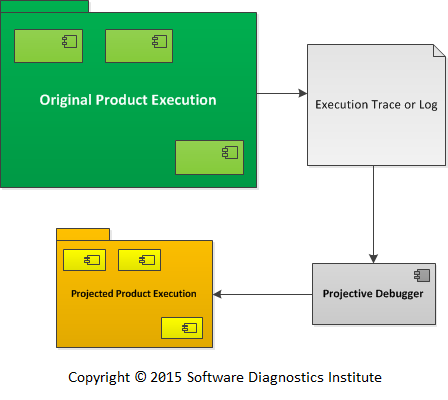 The logs and traces from the original product execution are translated by Projective Debugger. For example, the Projective Debugger (ProjectiveDebugger.exe) interprets these very simple messages below, and creates a process PID220.exe (we have only one thread), and then opens a file “data.txt”. After 10 seconds, it closes the file. In addition to executing code corresponding to messages using the same time deltas as read from the trace, it may scale execution time proportionally, for example, executing 2-day log in a matter of minutes. Such scaling may also uncover additional synchronization bugs. The trace may be pre-processed, and all necessary objects created before execution or it may be interpreted line by line. For complex traces, the projected source code may be generated for later compilation, linking, and execution. Once the projected code is executed, breakpoints may be set on existing traces, and other types of Debugging Implementation Patterns may be applied. Moreover, we may re-execute the trace several times and even have some limited form of backward execution. Picture 5. 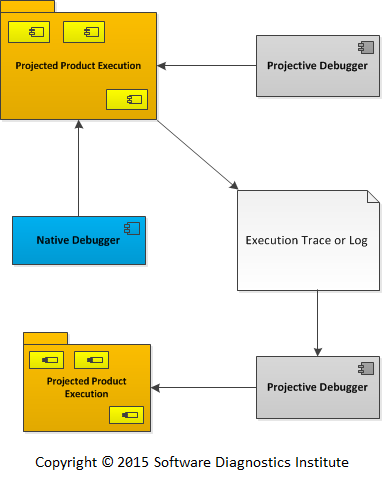 Projected Product Execution is inspected by a native debugger and also generates its own set of traces and logs to be projected to another model by another instance of the Projected Debugger. We created the first version of the Projective Debugger and successfully applied to a small trace involving synchronization primitives across several threads. The Projective Debugger was able to translate it into an executable model with the same number of threads and the same synchronization primitives and logic. The resulting process was hung as expected and we attached a native debugger (WinDbg for Windows) and found a deadlock. Picture 6. 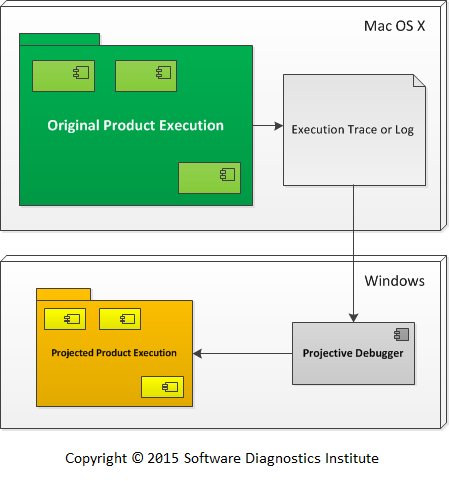 The traces and logs from the original product execution on Mac OS X are projected by a Windows version of Projective Debugger into an executable model for a Windows platform. Since resultant executable models can also have corresponding logging instrumentation mirroring original tracing, any problems found in executable models can be fixed iteratively and, once the problem disappears, the resulting fix or configuration may be incorporated into the original product or system. If tracing involves kernel space and mode, a specialized projected executable can be created to model the operating system and driver level. The more tracing data you have, more real your projected execution becomes. However, we want to have enough tracing statements but not to complicate the projected model. Then, ideally, we should trace only relevant behavior, for example, corresponding to use cases and architecture. Projective Debugging may also improve your system or product maintainability by highlighting whether you need more tracing statements and whether you need more accurate and complete tracing statements.